Psoriasis is a condition on skin that contains a thick layer of skin on the skin and create itchy dry patches on the skin.Psoriasis disease on the skin usually emerges as a red color surface on our skin, and Scalp (behind the hair of the head) is more on handpath or hand palms,foot soles,elbows,knees and back.This disease can happen to anyone else at any time. Many times people get rest assured by treating it as cured after treatment, but this disease can happen again.Psoraisis disease can also be hereditary.In addition to heredity,the environment is also considered to be a major cause for its occurrence.Psoriasis is a problem of many people,many times the skin starts to be very itchy before the disease.Keep in mind if you are not properly treated this problem,you may have more skin related problems.Treatment of psoriasis is possible,but it is necessary to treat this disease in time. These are mostly due to non-nutritious food,unhealthy diet.If you have a lack of nutritious ingredients in your diet,you can get this disease.Psoriasis is also caused by not having moisturizer on the skin, skin loss moisture.There is problem of psoriasis due to lack of skin care,staying out in very high sunlight and not being able to take light sunlight in the morning.Some medicines can be consumed for the treatment of psoriasis but to get rid of it,it is important to take care of your skin and diet properly. Red patches on the skin covered with silvery scales. Dry,cracked skin and sometime bleed. 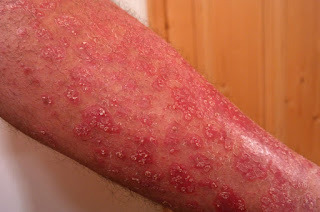 If there is a possibility of psoriasis consult with specialist doctor and follow the instructions given by him,so that the disease is under control.Protect the skin from being dry too much so that the itching does not occur.Improve your diet,eat healthy and follow healthy and active lifestyle.